OSOGOVO basks in the light of the end of the day as salt is unloaded onto the Granite State Minerals terminal. 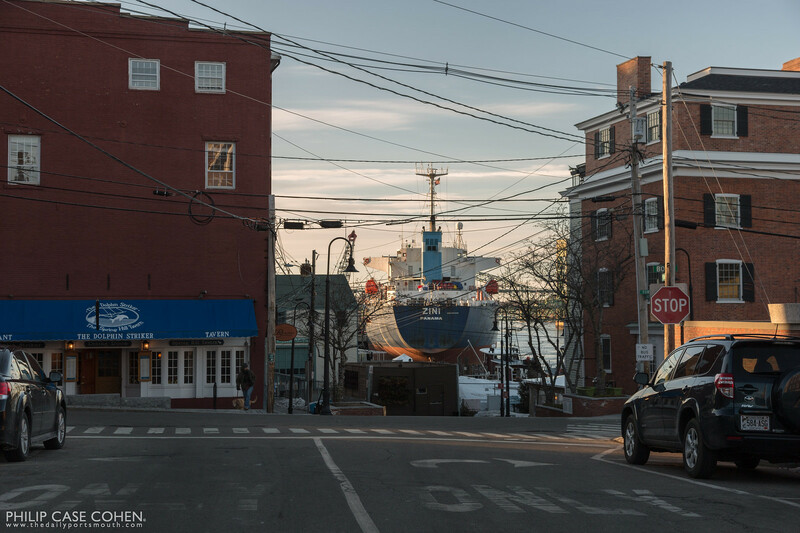 This is one of my absolute favorite views in Portsmouth – looking down Penhallow Street when there is a freighter in port unloading salt at the Granite State Minerals terminal. The Zini from Panama was in port for a long time – replenishing the diminished piles of salt on Market Street. 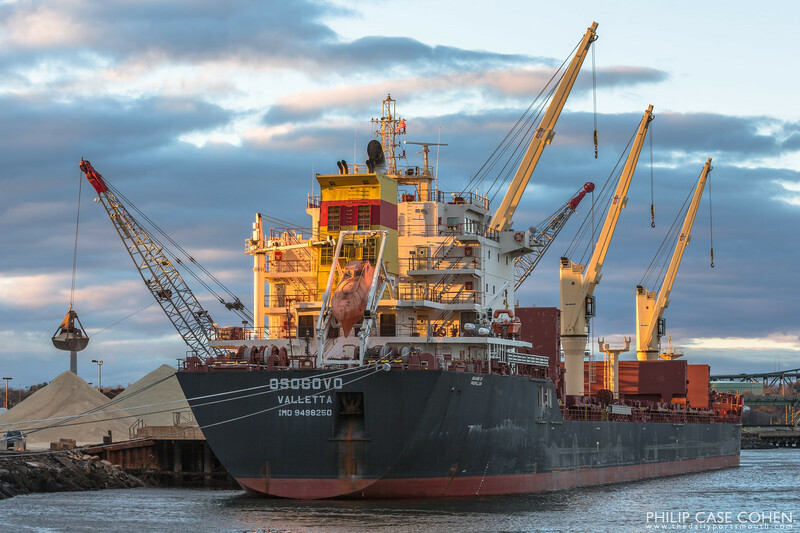 It’s no secret that I am obsessed with freighters that navigate the Piscataqua River. 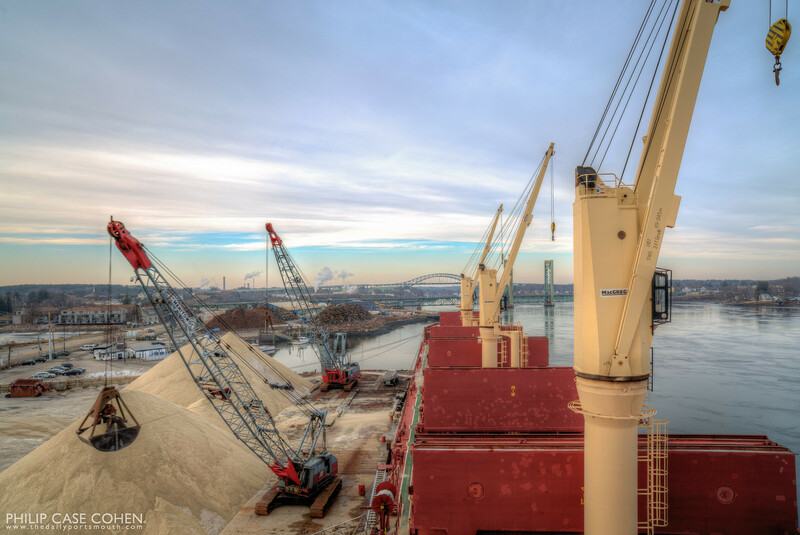 I had the opportunity to shoot from the deck of Osogovo, which was recently in port and unloading salt at the Granite State Minerals terminal on Market Street. One of my favorite times of year is winter, but not for the same reasons as many other New Englanders (like skiing, etc.). Winter is one of my favorite times of year because of the increased commercial freighter traffic on our waterways…when on certain days I can be driving home for lunch, and spot massive ocean traveling ships by the pair. 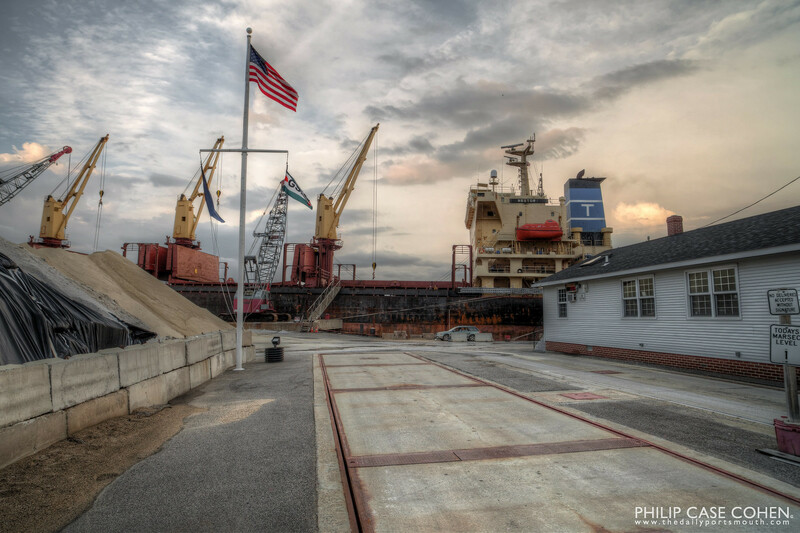 In this mid afternoon shot, a freighter is docked at the Granite State Minerals terminal as well as the State terminal a bit further up river. The crystal clear blue skies are a bit of a departure from my usual moody skies and sunsets…hope you enjoy! I’ll never tire of watching the cranes unload materials from the freighters at Granite State Minerals’ Market Street terminal. Sunset adds another element to the process, contributing a rich glow to the crane structure and the sand as it falls out of the crane’s claw. A new freighter has been in port for the last few days. The empty sand and salt depot is now a distant memory, and it’s chock full of materials ready to head throughout New England. 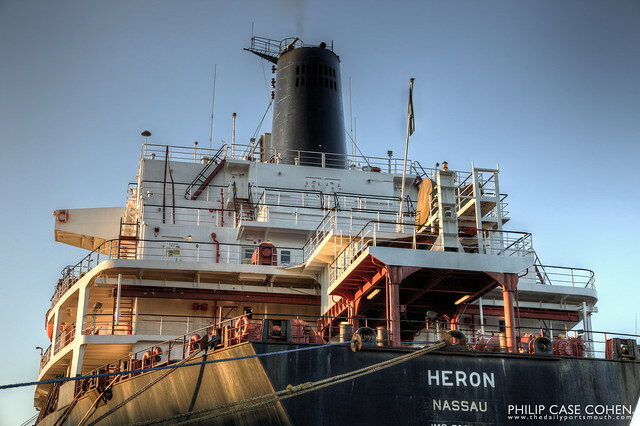 The HERON from Nassau is a very cool looking ship – you might not know it from this angle, but it has two huge structures on its deck that look like cages – compared to the freighters I’m more used to seeing, which have their own cranes on their decks. I’ll feature a few more shots later this week so you can have a glimpse of what makes this ship a bit different. I loved the late day light on the ship’s hull and the closeup of the upper decks.